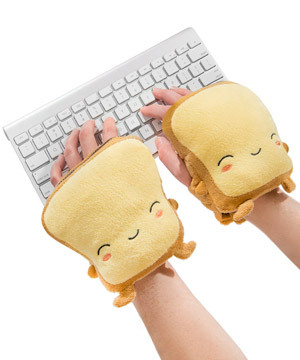 Toasty Wireless Hand Warmers: Electronic mitts shaped like cute toast. Keep your hands nice and warm with Toasty Wireless Hand Warmers. 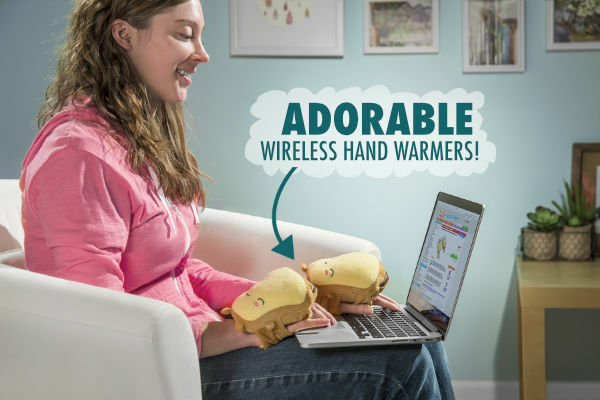 The squishy set of plush warmers are shaped like pieces of cartoonish toasted bread, warming your heart as they warm your hands. Each warmer holds a battery that can be recharged over USB. Once charged, slip the battery into the zippered pouch, strap the toast over your hands, and feel the soothing heat thaw your chilly bones. 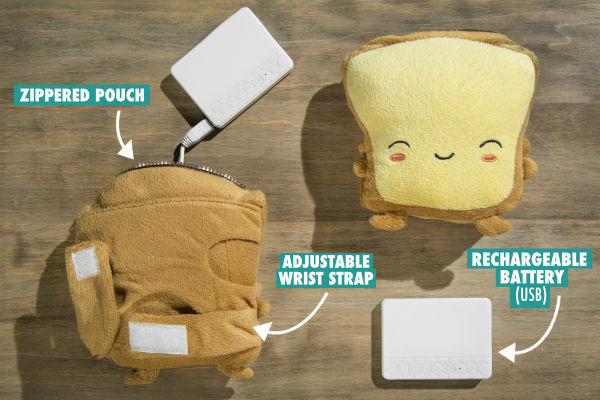 The warming feeling might just make you as happy as the smiling toast characters strapped to the back of your hands. Luckily, the cord-free warmers give you the freedom to do your happy dance. 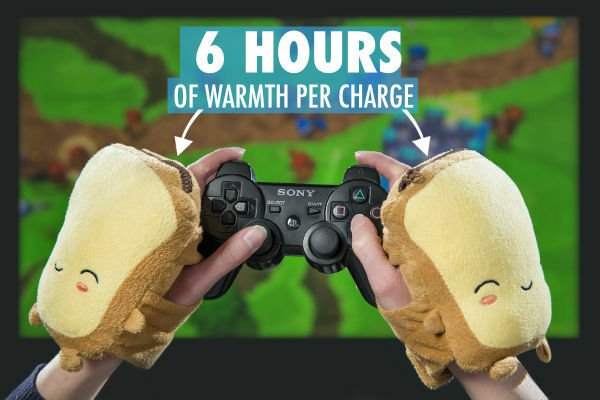 Provides 6 hours of warmth per charge. Enjoy the feeling of a cozy electric blanket heating your hands while giving your fingers the freedom to type, knit, or butter a slice of toast. And while the warmers are functional, they’re cute little cartoon slices of toast to boot! Toasty Wireless Handwarmers are all about pampering you. Replacing batteries is no fun, so they recharge over USB. And your hands deserve to be nestled next to soft slices of toast that fit just right, so they come with an adjustable wrist strap. The batteries in these rechargeable fingerless mitts last about six hours per sesh. That’s enough time to score mad XP on your current video game obsession, knit a scarf for Nana, or bang out the first few chapters of the next great novel. Part of a completely cozy breakfast. Answer: No, Toasty Wireless Handwarmers stay within a temperature range that’s noticeably warmer than your internal body temp but not so hot to be uncomfortable. Burnt hands are about as fun as burnt toast, and these mitts are a just-right golden brown. Question: How long does it take to recharge? Answer: The batteries take about two hours to juice up, but you can continue to keep your hands toasty as they charge! Throwback winter gloves that change colors in the cold.